A millionnaire family is attacked by a blackmailer. They will be ruined if he always succeeds. Evan is engaged to protect the old man from the crowd and from their blunders. But he had to play the role of a detective to help this family to discover the mystery in this affair. Will he succeed? Discover what happen! At first Evan had some doubts as to what ought to be his course of action in respect to Mrs. George Deaves. While it was true that her husband had definitely given him to understand that he was hired for the purpose of running down the blackmailers, he did not suppose that George Deaves would thank him for proof that his own wife was implicated. But that didn't alter his duty. "I'm being paid to deliver them from the gang," he said to himself. "As long as I take their money I've got to do what I can to earn it. It's none of my affair where the trail leads. If they want to kick me out for my pains, why that's up to them." It promised to be no easy matter to watch Mrs. Deaves. Evan rarely saw her. During the few hours that he spent in the house she was presumably either in her own rooms, or out in the motor. One suspicious circumstance he did not have to look for, because everybody in the house was aware of it. Maud Deaves was continually in money difficulties. Her creditors camped on her trail. Two lines were open to Evan: to bribe her maid and to watch her letters. The maid, Josefa, was a light-headed creature perfectly willing to plot or counterplot with anybody. Unfortunately she was of very little use to Evan, because her mistress did not trust her in the least. As for the letters, it was scarcely likely that if Maud Deaves were carrying on a dangerous correspondence she would have the letters come openly to the house. Nevertheless Evan determined to get to the house early enough in the mornings to look over the first mail before it was distributed. On the morning following his trip on the Ernestina he found a letter addressed to her that gave him food for reflection. The address was typewritten. The envelope was of medium size "Irish linen" of the kind that never saw either Ireland or flax; in other words, just such an envelope as those which had brought the blackmailing letters. In itself this was nothing for many thousands of such envelopes are sold. But it was postmarked "Hamilton Grange" and it was addressed "New York City." The three little facts taken together were significant. Evan slipped it in his pocket. But though it had the look of a mere business letter or a bill, he still had qualms about opening it. Useless to tell himself that it was his duty to do so. To tell the truth Evan was not cut out by nature to be a detective. He finally decided to put his problem to George Deaves. 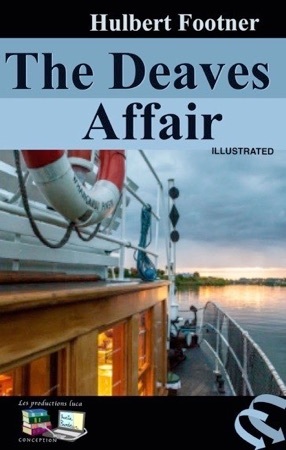 "Mr. Deaves," he said, "am I employed to accompany your father on his walks or to discover the blackmailers?" "Primarily to run down the blackmailers," was the prompt reply. "Merely to go with my father is not worth all the money I'm paying you." "Very good. Then I'm supposed to follow the trail wherever it may lead?" "Of course. I told you particularly to watch the servants. Whom do you suspect?" "I have no evidence yet. I merely wanted to know where I stood. Would I be justified in opening letters that looked suspicious to me?" "Why, yes. The guilty person wouldn't tell you of his own accord." "Thanks; that's what I wanted to know." "Have you found out anything?" Deaves asked eagerly. "Mind, you are to find out everything you can, but you are not to take any action without consulting me." I am exceedingly sorry to be obliged to inform you that my customary fortnightly contribution to your charity must be omitted on this occasion, the reason being that the activity of a certain agitator has resulted in shutting off the income from my business, and I am without funds. I am sure you will agree with me that these agitators ought to be discouraged in every possible way. Let us make a stand against them. You can reach me at this hotel at any time. This had an innocent sound, and for a moment Evan supposed he had made a mistake in opening it. But he read it again, and began to grin as the various implications of the note became clear to him. « Damn clever!" he thought. "If this was found lying about no one could suspect anything from it. Not even George Deaves. Why, it almost took me in and I was forewarned!"